Description: Erect loosely or occasionally somewhat densely tufted perennial to c. 0.3 m high; culms slender, usually exserted well beyond basal leaves. Leaves with sheath shallowly ribbed; ligule membranous, truncate, 2–2.5 mm long; blade folded or inrolled, 0.5–1 mm wide, smooth, glabrous or bristly on lower surface. Panicle 2–8 cm long, loosely contracted, narrow-elliptic to linear, lower branches often bare at the base. 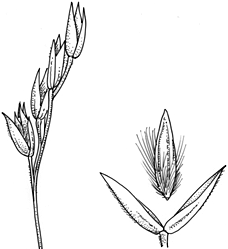 Spikelets 2–3.5 cm long. Glumes subequal, acute. Lemma subequal to glumes, 2.2–3 mm long, 5-nerved, with or without a small straight terminal awn usually not exceeding the lemma; callus hairs dense, usually half as long as lemma. Palea slightly shorter than lemma. Distribution and occurrence: Often grows on hillsides or slopes, often by creeks and in swamps.